“Yankee” at sea in 1935. The sport developed rapidly towards the end of the 1920s, continuing to do so throughout the 1930s. Improved know-how, better technology and new materials contributed to the boats’ increased speed. Sails and rigging developed, resembling what we see in modern day boats. 1929 saw the new set of measurement rules for the new J-class, paving the way for boats the length of some 120 ft, with masts as high as 50 metres. An agreement was signed in 1930, allowing America’s Cup entry for the class. In spite of high costs, at a financially challenging time in modern history, four J-boats were launched in America during the spring of 1930: ”Enterprise”, ”Yankee”, ”Weetamoe” and ”Whirlwind”. The first to win the American qualification races, the “Enterprise”, later beat the British “Shamrock V” in the finals, cost something in the region of USD one million. J-boats also participated in the 1934 and 1937 America’s Cup. The “Rainbow” was built for the 1934 cup, winning the American preliminaries, resulting in her scant victory over British “Endeavour”. 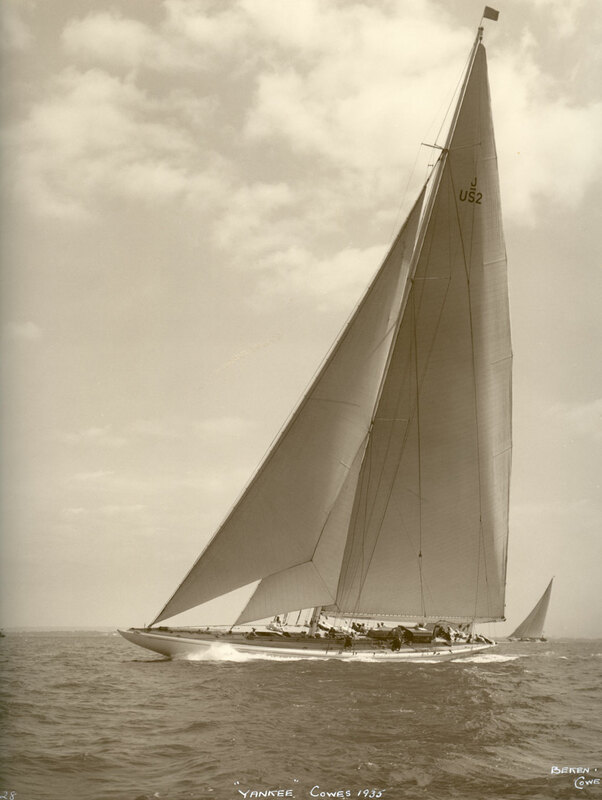 The “Ranger” was newly built in 1937, winning most races she attended that year, including America’s Cup, challenged by “Endeavour 2”. The “Ranger” had a 401 m² genoa (jib/staysail) and a 1672 m² spinnaker. Up until 1937 the J-class boats attended other races, too. For instance the “Yankee” crossed the Atlantic in order to race in England during the summer of 1935. At the time sailing a J-boat required a crew of approximately 25. In 1930 Engel Vaage (also known as John Christensen) is sailing master at the “Weetamoe”, resulting in a ¾ Tysnes crew. Gunnar Gjerstad (also known as Gust. Olsen), sailing master of the “Yankee” through her racing years, also took on a Tysnes crew, albeit not quite as many. Johannes Anderson Malkenes (who usually went under the name Johannes Anderson) is 1st mate of the ”Whirlwind”, accompanied by several Tysnes crewmen. The “Enterprise”, winning the American preliminaries, later to beat “Shamrock V”, probably counted no more than one “Tysnesing” among her crew. A few Tysnes men manned the winning boats of 1934 and 1937, the “Rainbow” and the “Ranger”. In this decade, too, we find Tysnes sailors on smaller yachts, like the M-class, which is somewhat smaller than the J-class. The lodging vessels and tugboats following the J-boats during regattas needed crews, too, quite often Tysnes sailors. Gustav Lunde Malkenes, known as Gus A. Lunde, served as captain on “Weetamoe”s tugboat, the “Magistrate” in 1930, bringing two Tysnes sailors with him. Which was his monthly salary. The American J-boats were short-lived. The last of them was scrapped in 1941. In Britain, however, both the “Shamrock V” (to the right), “Endeavour” and the tenth J-boat, the “Velsheda”, survived, later to be restored – and still sailing. A few copies have been built, and more are rumoured to be underway. British plans even existed for a 2012 J-class regatta. In the early 1930s the American millionaire Gerhard B. Lambert owned the renowned schooners “Atlantic” and “Vanitie”, the latter fronted by Engel Vaage (John Christensen) as captain, in a collaboration that went very well, apparently. Following the 1934 America’s Cup Lambert considered one season’s sailing in America. The “Vanitie” was way past its prime, prompting Lambert to acquire the “Yankee” for that purpose. The “Yankee” is prepared during the spring of 1935, leaving Boston on 25 April, alongside the “Atlantic”, setting course for England. The “Atlantic” set a record in the 1905 Kaiser’s Cup, crossing the Atlantic ocean in 12 days, 4 hours and 1 minute, raising expectations as to which would come in first in this unofficial regatta among the two. Article continued after photograph. The crew of J-boat “Yankee” in Gosport, England in 1935, most of which from Tysnes. “Yankee” partook in numerous British regattas, as well as in France. The “Yankee” sported a professional crew of 23 during her crossing, of whom 18 from Tysnes, in addition to an after guard, including some of the owner, Mr Lambert’s friends. Gunnar Gjerstad (Gust. Olsen), holding the position as captain since her launch, remains in that position. Engel Vaage‘s (John Christensen) health is deteriorated, necessitating public transportation to England, in order to partake in the races there. The “Yankee” arrives in Lizars, England, after 15 days and 17 minutes, 17 minutes ahead of the “Atlantic”. The “Atlantic”s 1905 record wasn’t broken until 75 years later. Between 6 June and 28 August the “Yankee” attends several regattas along the English coast, racing “Endeavour”, “Velsheda”, King George‘s “Britannia” and several vessels of the so-called big boats class. They sailed in France for a week, too, amounting to a sum total of 32 races. By the time only one regatta remained to be raced that season, the “Yankee” had won eight, the “Endeavour” nine. The “Yankee” led that final race by the first rounding, but broke her mast at the rounding of another mark, forcing her to break the race. Lambert considered one more season in Britain, which never came to be. 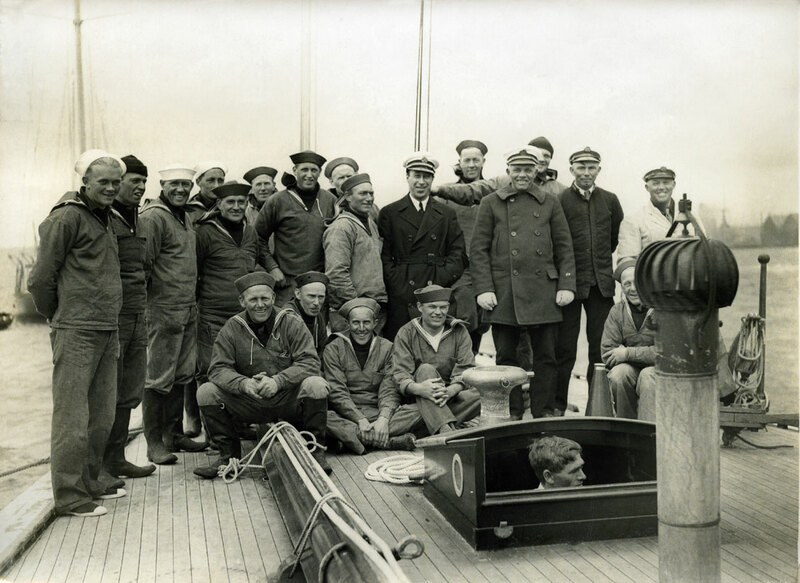 The “Yankee” set sail for America in 1936, with Ole Gundersen Teigland (also known as just Ole Gundersen) as captain. Rough weather made the return a dramatic crossing, but she returned safely to Boston after 22 days. The “Yankee” was the only American boat to sail in Britain. Upon her 1941 scrapping, Lambert donated the revenues to Her Majesty the Queen, who in turn passed the money on to what was then known as the London Hospital.